After a controversy-laden season that saw them miss the playoffs, the Vancouver Canucks hope for big years from their veteran stars as they try to restore the franchise's lustre under new management. This is part of our series of quick season previews for the seven Canadian-based NHL teams. We've also covered the Calgary Flames, Edmonton Oilers, Winnipeg Jets and Toronto Maple Leafs. Last season's record: 36-35-11 (83 points), 5th out of 7 in Pacific Division, missed playoffs. Last season's story: What a disaster. Vancouver responded to back-to-back first-round exits by bringing in fiery coach John Tortorella, but he burned out fast and was canned after the season by new president Trevor Linden. (GM Mike Gillis got the axe with a few games left.) Trade rumours involving two of the Canucks' biggest stars — Roberto Luongo and Ryan Kesler — hung over the fading team until they were finally dealt in, respectively, March and June. 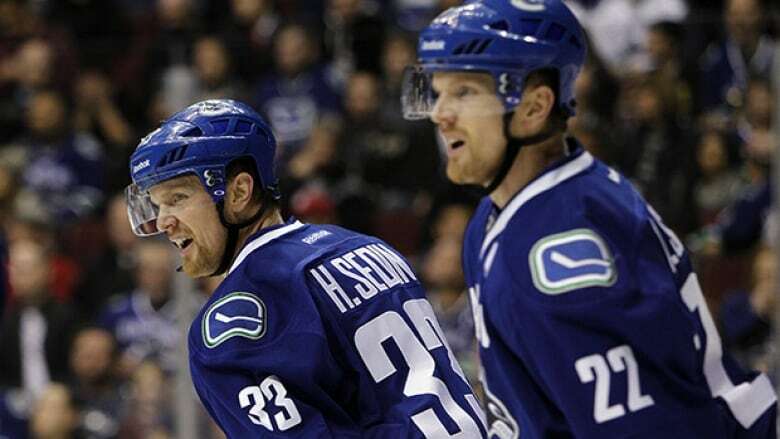 The remaining franchise players, aging twins Henrik and Daniel Sedin, led the team in scoring, but their production (50 and 47 points, respectively) was easily their worst in a decade. Key off-season additions: G Ryan Miller, F Radim Vrbata, F Nick Bonino, D Luca Sbisa, coach Willie Desjardins, GM Jim Benning. Key off-season subtractions: F Ryan Kesler, F David Booth, F Mike Santorelli, D Jason Garrison, coach John Tortorella. Best-case scenario: Desjardins brings a calming influence to the bench (the bar is pretty low); the Sedins return to their point-per-game form; Miller reclaims his reputation as one of the league's best goalies; Kesler trade acquisition Bonino proves to be a rising star; and the Canucks survive the top-heavy Pacific Division to return to the playoffs. Worst-case scenario: The Sedins' off year turns out to be the start of a painful decline; Miller (who's also 34 years old) shows his age too; and the Canucks are passed in the standings by young clubs in Calgary and Edmonton, triggering a full rebuild by first-year GM Benning.